The men whose spirit of exploration, innovation and creativity led to our state’s booming wine industry are gone. They would be delighted by what they inspired, by what their dreams became. 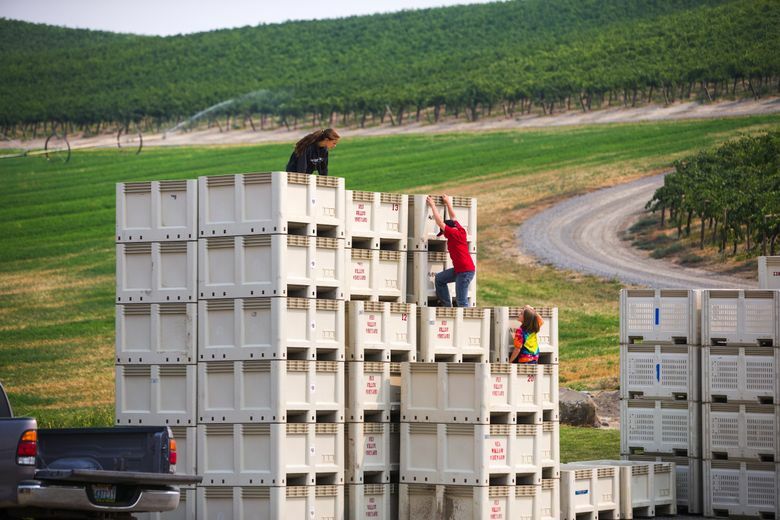 TODAY, MORE THAN 50,000 acres of wine grape vineyards are planted in Washington, a number that has quadrupled the past two decades. But across our state are echoes of an earlier era, of a simpler time when men with dreams began to envision the possibilities. These men are gone, but a few of their vines remain. These old soldiers stand guard, impervious to the intense heat of summer and the bitter cold of winter. These silent sentries have watched time march on as an industry has taken hold and relentlessly spread across the land. They have stories to reveal, insights into how we arrived here. 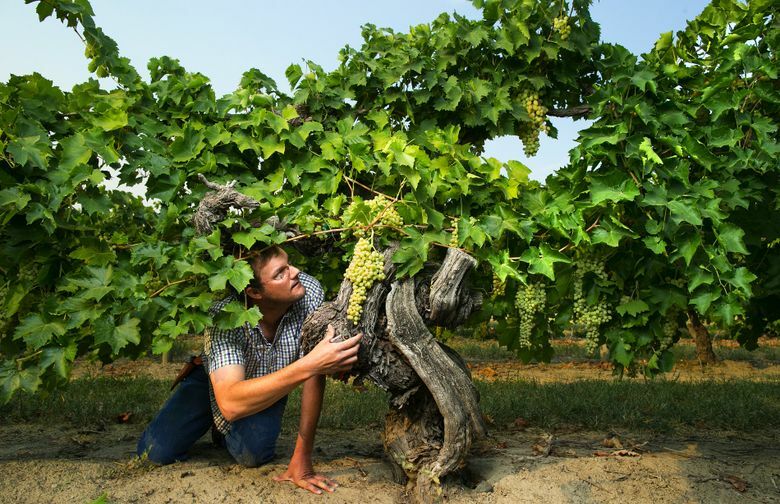 Though these old vines span the state, they are intertwined, weaving tangled tales about legends, pioneers, visionaries and entrepreneurs. These old vines are ready to reveal their secrets. GRAPE GROWING in Washington dates to at least the 1820s, according to “The Wine Project,” author Ron Irvine’s definitive history of the state’s wine industry. 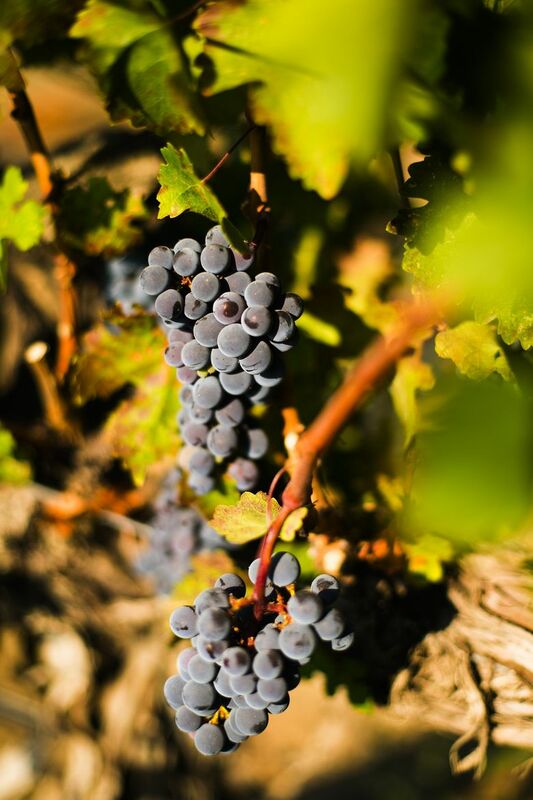 Most certainly, grapes were grown and wine was made by the 1860s in Walla Walla, and the state’s first winery launched in 1874 in East Wenatchee. But none of that remains. To find some of the oldest vines and first post-Prohibition winery, one must travel northwest of Olympia to an obscure corner of the Puget Sound. South of Belfair just off Highway 3 is Grapeview. One might expect such a community to be nestled in the Yakima Valley, perhaps near such optimistically named towns as Grandview, Sunnyside and Outlook. But it’s here in Mason County, under gray skies and tall trees. A two-lane bridge crosses onto Stretch Island, a 300-acre piece of land that is home to beautiful houses and a few peeks into the past of Washington’s wine industry. At one time, most of this island was covered with a grape variety called Island Belle, and three wineries and a couple of juice companies thrived here. Today, little is left. Just a couple of small vineyards and the occasional wild vine growing in a meadow. On one edge of the island lives Harley Somers, whose athletic build and youthful enthusiasm give few clues he is in his early 70s. Somers, who works with shellfish, is the son of Bill Somers and grandson of Charles Somers. His uncle, Howard Somers, was a winemaker at American Wine Growers and made the first wines for a new label in 1967 called Ste. Michelle Vintners. That turned out to be something much bigger. He starts with a few rows of gnarly old vines that were planted by his grandfather in 1922. Past that, behind his home, is a solitary vine that stretches perhaps a dozen feet across. It was planted in 1872 — 17 years before statehood. This vine is all that is left of Lambert Evans, a Confederate soldier during the Civil War. After being captured and held as a prisoner in St. Louis, Evans was released after the war and walked to California. He made his way up the coast, bought 40 acres on Stretch Island and planted grapes for the express purpose of making wine. Evans eventually sold his land to Charles Somers. After the dark veil of Prohibition was lifted in 1933, Somers opened St. Charles, the first winery in Washington after Repeal. St. Charles was done operating by the mid-1960s, but the winery building remains. Inside are artifacts of a once-healthy operation. One room is filled with old bottles from various wineries up and down the West Coast. This and Evans’ vine are all that remain of the genesis of Washington’s modern wine industry. ACROSS THE STATE in the heart of the Yakima Valley is Snipes Mountain, named for Ben Snipes, a cattle baron in the 1850s. It really appears as just a tall hill near Sunnyside. From Interstate 82, one can see a squat water tower with a Superman logo painted on it and Mount Adams looming on the horizon. Grapevines dominate Snipes Mountain. In the early 1900s, a Canadian named William Bridgman arrived. He was a lawyer who ended up writing water-rights laws — some of which remain on the books — and he was the two-time mayor of Sunnyside. But his greatest contribution was wine grapes. Not far from that water tower is a special block of vines, perhaps an acre in size. On one side are Thompson Seedless vines with huge, curled trunks that give quick indication to their age. Beside them are muscat of Alexandria vines. They don’t look nearly as old as the Thompsons, though both were planted in 1917 by Bridgman himself. In 1934, Bridgman started Upland Winery, which lasted into the 1960s. His was a large operation, and some of his buildings and concrete fermentation vats remain just a few steps from the old vineyard. Bridgman doesn’t get a lot of credit for what he did to help Washington emerge from the haze of Prohibition. Most of that goes to Walter Clore, a researcher who arrived at Washington State University’s agricultural outpost in nearby Prosser in 1937. But Bridgman gave Clore a few vines, an event that led Clore to become quite fascinated with the possibilities of a wine industry. Today, Clore is hailed as “the father of Washington wines.” If that is true, then Bridgman surely is their grandfather. In the late 1960s after Bridgman’s death, his nephew sold the vineyards to the Newhouse family, which continues to farm it today. Third-generation grape grower Todd Newhouse oversees the operations at Upland Vineyards. Nearly a decade ago, he launched a small winery and, to honor the contributions made by Bridgman, named it Upland Winery. From those few remaining muscat grapes planted by Bridgman, Upland winemaker Robert Smasne makes a delicious ice wine. JUST EAST OF SUNNYSIDE is an old vineyard. 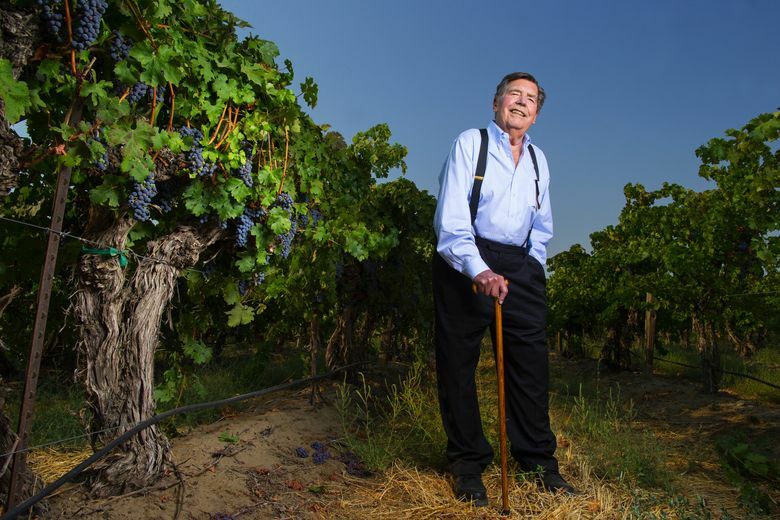 Otis Harlan, now in his mid-80s, stands amid cabernet sauvignon he planted in 1957 — the oldest cab vines in Washington. 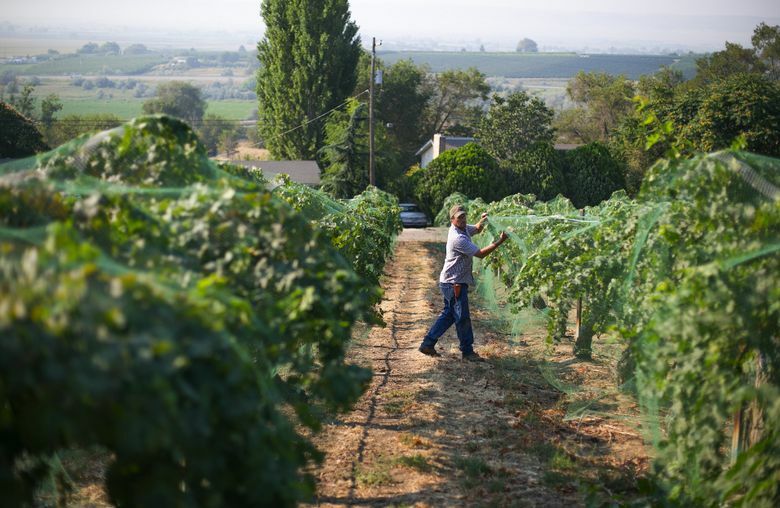 His eyes mist over as he walks between the rows and recalls vivid memories of working with some of the giants of the Washington wine industry. Harlan’s dad started Alhambra Winery in the 1940s in Selah, not far from Yakima. After Harlan graduated from Whitman College in 1952, his dad put him to work at the winery. The operation needed grapes, so they bought this vineyard north of Grandview and renamed it Otis Vineyard. Soon after, he met Bridgman. In 1965, Harlan bought St. Charles Winery, not the land or the building on Stretch Island, but the brand itself. “We needed their grape contracts,” Harlan says. Ultimately, apple juice was more lucrative for the Harlans than wine, so they shuttered Alhambra but kept the vineyard. Harlan began selling his grapes to Associated Vintners, later renamed Columbia Winery. That’s how he got to know David Lake, who became Columbia’s winemaker in 1978. 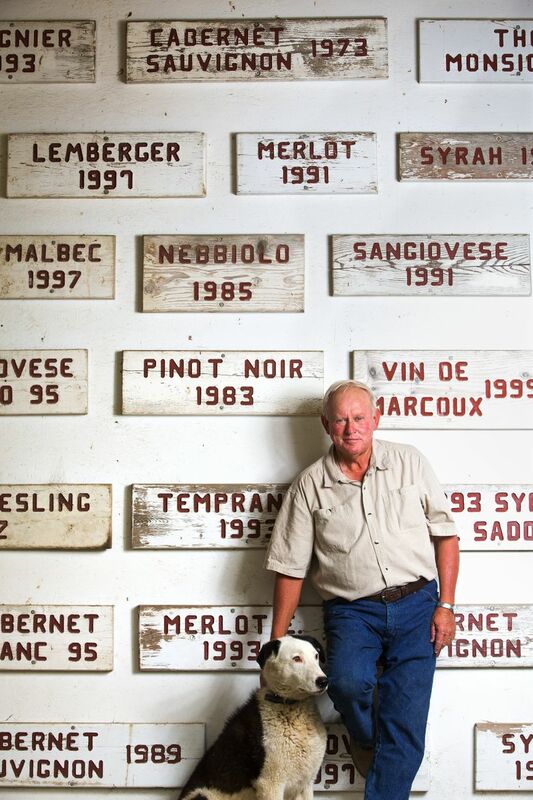 Lake, who died in 2009, was a Washington wine pioneer, one of the state’s first professionally trained winemakers. 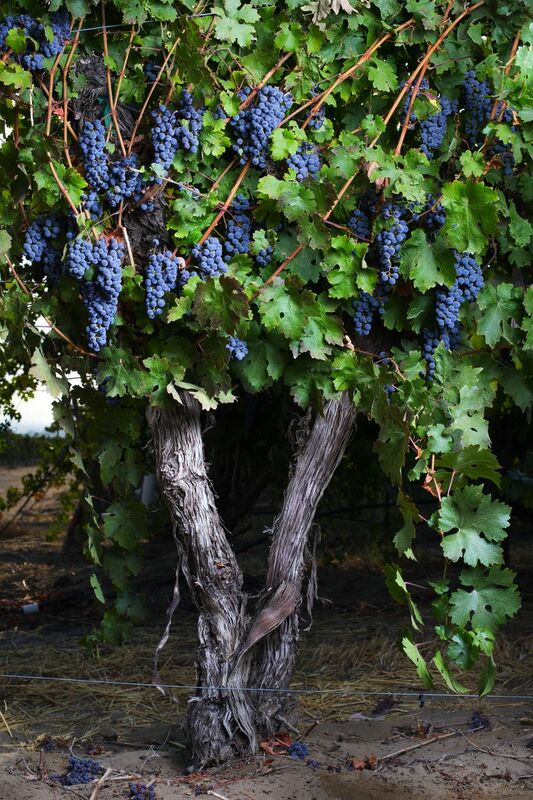 He treasured these old cab vines and turned their fruit into something special. 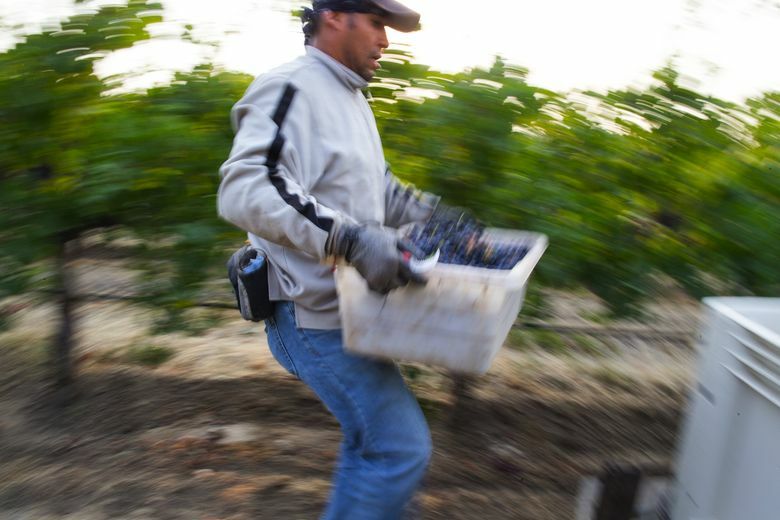 Harlan kept Otis Vineyard through the 2013 harvest, when he sold it to Sean Tudor, whose family has a rich history in the California wine industry that stretches back to the 1940s. NOT FAR FROM Snipes Mountain is a funny little 5-acre vineyard that is surrounded by homes. It’s called Harrison Hill and is a treasured bit of ground, thanks to Bridgman and Lake. In 1914, Bridgman planted his first vines on Harrison Hill. These grapes didn’t last as long as those he planted just a couple of miles away on Snipes Mountain. But nearly a half-century later — in 1962 — Bridgman sold the land to a group of University of Washington professors who had launched a winery called Associated Vintners. AV, as it was known, was the first Washington winery to focus exclusively on using European wine grape varieties. A year after buying the land from Bridgman, the professors planted cabernet sauvignon grapes on Harrison Hill — vines that remain today. In the 1970s, the Newhouse family bought Harrison Hill from Associated Vintners, and the grapes were sold each fall to Chateau Ste. Michelle. The vineyard was so small and nondescript, most of the folks at Ste. Michelle didn’t know its provenance. But in the early 1990s, Lake was helping a group of young men launch a Woodinville winery called DeLille Cellars. Lake remembered this old vineyard and drove winemaker Chris Upchurch here. “He kind of poked me and said some little winery could do something special with it,” Upchurch recalls. So Upchurch approached Allen Shoup, then CEO of Ste. Michelle, and asked if he could take over the contract for Harrison Hill. Shoup, ever the visionary, was more than happy to let the young DeLille team give it a go. What Upchurch crafts from these precious gems is Harrison Hill, a red wine that is one of the most expensive and collectible wines in Washington. ABOUT 50 MILES west of Sunnyside is Red Willow, a vineyard with rich connections to Bridgman and Lake. In the early 1970s, Mike Sauer got cuttings from those old cabernet sauvignon vines at Harrison Hill and planted them in the shadow of Mount Adams. Today, Sauer and his sons sell grapes to three dozen Washington winemakers. But starting in the 1970s and lasting until just a decade ago, most of his fruit went to Lake, and Columbia Winery. Some of Lake’s most famous wines came from Sauer’s grapes at Red Willow. Their work together began in 1978, when both were at a grape growers meeting. Sauer needed a ride back to his vineyard, and Lake was going that way, so he offered a lift. It was the beginning of something special. In 1984, Lake approached Sauer about planting syrah, a red grape famous in France’s Rhône Valley. 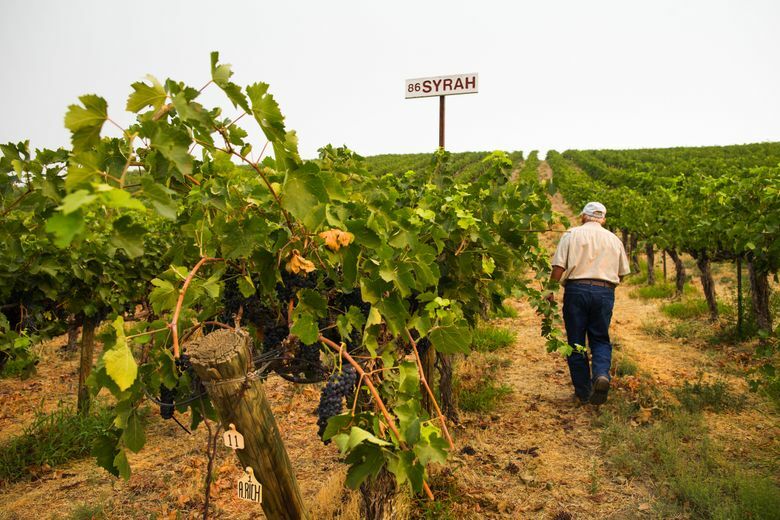 Sauer was enthusiastic to try it, so Lake acquired cuttings in 1985, and the first syrah vines in Washington went into the ground the next year. Lake recognized the historic significance of the moment and brought a few bottles of Côte-Rôtie, perhaps the most famous wines in the Northern Rhône. Somewhere in that original block of syrah, Lake and Sauer buried one of the bottles, meant to inspire the vines to achieve greatness. 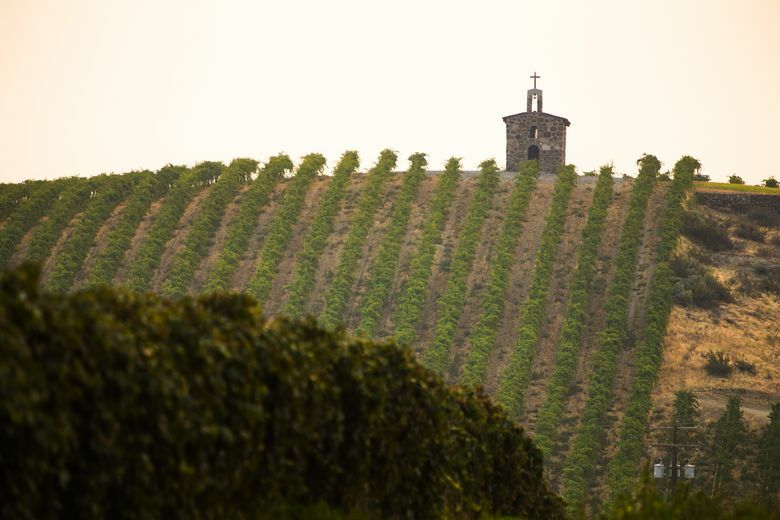 In the early 1990s, Sauer built a small chapel at the top of his vineyard. Today, it is one of the most iconic buildings in Washington wine country. Columbia Winery was quick to include a drawing of the stone building on bottles of Red Willow-designated wines. After Lake’s retirement in 2005, the owners of Columbia Winery stopped purchasing Red Willow grapes. Today, Woodinville winemaker Bob Betz buys some of the grapes from those old syrah vines and crafts a wine called La Côte Patriarche, a name that honors the vision that Lake and Sauer had 30 years ago. IN THE 1940s, a man named Albert Ravenholt contracted malaria. He had family in Sunnyside, so he moved there for several months to recuperate. During this time, he met Bridgman, who told him about his grapevines and filled him with dreams of what Washington could become. In 1968, Ravenholt had the opportunity to act on those ideas that Bridgman planted two decades earlier. He and several partners, led by Seattle attorney Alec Bayless, purchased land along the Columbia River north of Pasco. Clore, still at WSU, checked out the property and gave it his seal of approval as an impeccable location for wine grapes. In 1972, the partners began planting Sagemoor Vineyards. In subsequent seasons, they planted two more vineyards: Bacchus and Dionysus. More than 400 acres were planted at Sagemoor, making it the first large-scale vineyard in the Washington wine industry. Sagemoor grapes provided the fuel that drove what has developed into the nation’s second-largest wine-producing state. Ravenholt and Bayless have passed away, but many of those original investors continued to own Sagemoor until last year, when it was sold to a longtime apple-growing family in Selah. 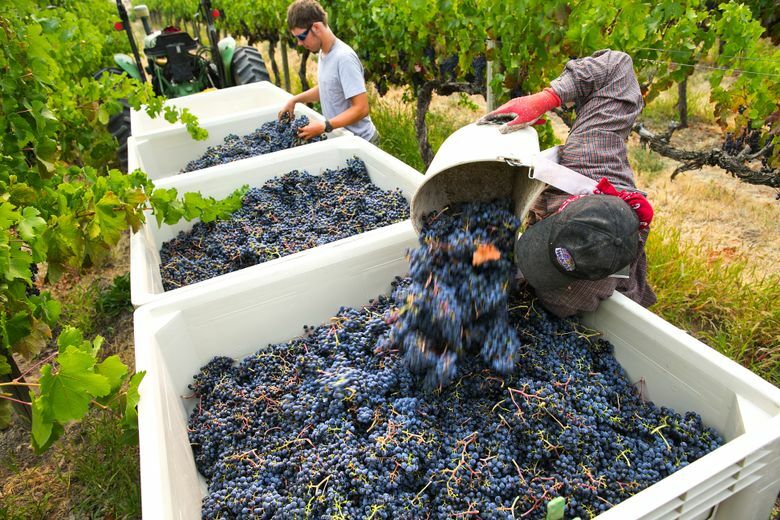 Today, Sagemoor still feeds the Washington wine industry, selling grapes to more than 70 wineries, nearly 10 percent of all the producers in the state. Evans, Bridgman, Clore, Lake. They were our wine industry’s visionaries. Their spirit of exploration, innovation and creativity directly led to today’s Washington wine industry. They would be delighted by what they inspired, by what their dreams became. They would marvel that some of their creations — these old vines — remain. Andy Perdue is a wine author, journalist and international judge. Learn more about wine at greatnorthwestwine.com. John Lok is a Seattle Times staff photographer.